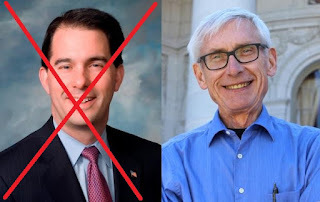 Wisconsin likes OATH OF OFFICE VIOLATORS that promise them a LIST OF LIES and DECEIT. Governor Scott Walker has made Wisconsin great again, but if he loses to this oath of office violator then Wisconsin can expect to drop back into the Socialist/Communist State that it has historically been. Thank you for not going out and voting for Scott. You just sold out Wisconsin to the enemies of America.